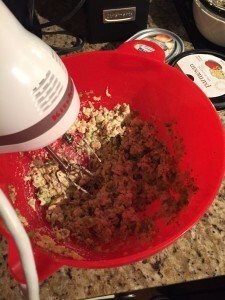 Man, I’m way behind on posting – but I’ve been keeping up with the recipes! Woo hoo! In Week 5, we tried the Broccoli-Stuffed Sole recipe from Recipe.com. I have this bag of frozen tilapia in my freezer that I wanted to try to do something with. First I set the oven to 350F, thinking it’d be enough time to get situated. It almost was. The cut broccoli that I’d thawed out was a bit to big. I probably should have put it in the food processor, but I ended up just attempting to break it up while mixing it in with the cream cheese (with onion and chives), stuffing, egg, and parmesan cheese. Once it looked like a good consistency to work with, I scooped some out and rolled up the tilapia with the mix inside. I failed to take pics of this, but because my tilapia filets had slits in them, it was a little more of a challenge rolling it up to make sure it didn’t fall apart. After all of the rolls were complete, I still had quite a bit of the stuffing left. The recipe called for 4 tilapia pieces, but I had enough stuffing to probably have 7 rolls (I made 3). I placed the rolls in the oven for 35 minutes and then started on the sauce. 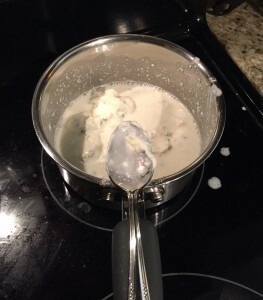 With the remaining cream cheese and some milk, the sauce was pretty easy to make. It ended up thicker than I imagined, but still workable. 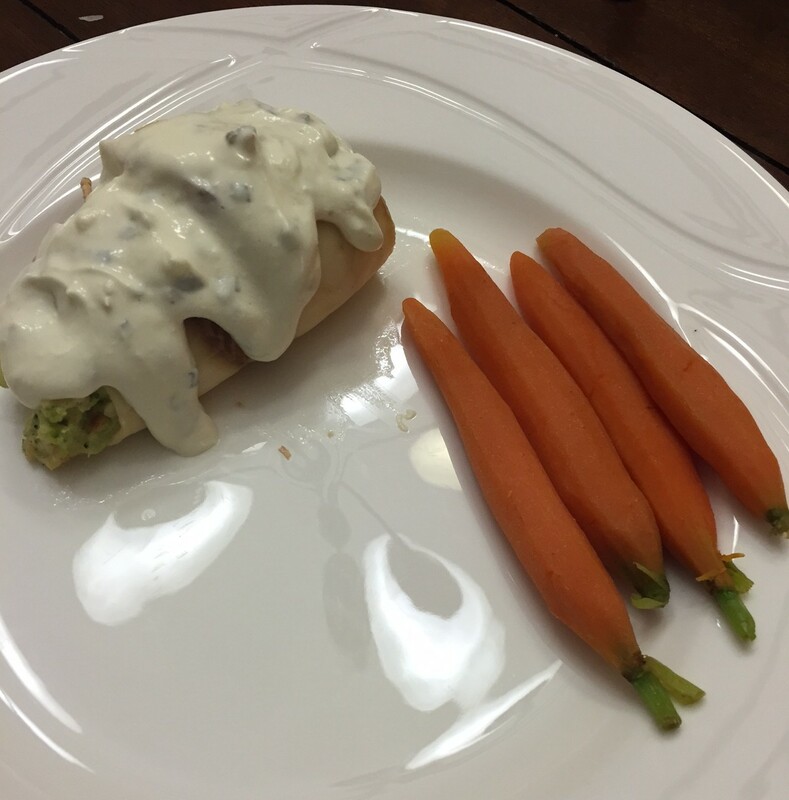 When the fish was finished, we paired the rolls with baby carrots and poured the sauce over the fish. While in the grand scheme of things, this recipe wasn’t difficult. Neither of us liked it, and we will likely not try it again. 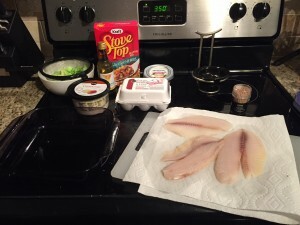 I *may* try a variation with regular cream cheese and chicken instead of tilapia. I am on the lookout for a good tilapia recipe though, so if you know of one, please share! Still have lots of frozen tilapia to go through! Josh – 2 out of 5 stars. Josh was not a fan of this one, but he stuck it out and tried to make it through it. The sauce was over powering.